I use my cellphone on emergencies only. When I do use it I use a Air Tube Earpiece or a speaker phone. In our Amazon store you can find a collection of Air Tube earpieces, from the mode expnsive brand to the cheaper China made Air Tube Earpiece. 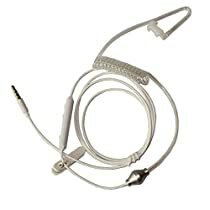 All Air Tube Earpiece will help you reducing the RF exposure while using a cellphone. I use these also for listening to music or audio on my laptop or mp3 players, since I can;t stand the magnet of the speaker on a normal earpiece for more than few minutes.